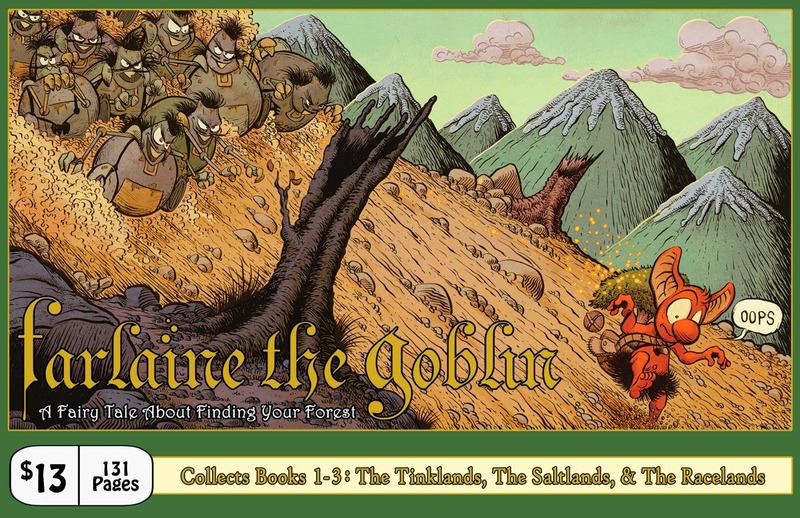 Farlaine the Goblin ~ A Fairy Tale About Finding Your Forest: "The real money is in trades..."
"The real money is in trades..."
The one thing you often hear from lots of working comic artists is that they make their real money from the trade paperbacks, and that they couldn't survive living just off the income from a monthly floppy comic. And I imagine for most of these guys that are successful and have a following and an audience, that's entirely true. Especially if they're with a publisher like Image or Dark Horse or IDW and are likely selling thousands of books at release and a steady pulse in the hundreds or thousands per month the rest of the year. For me, I was on the fence about even doing a trade. It's a 7 book series. Do you really need to collect it in smaller chunks as well? It makes complete sense to me as 7 small books and then 1 collected version. But no, a variety of people kept telling me that I should do a trade, people love trades, it's more exposure while waiting for the next book, etc, etc. So I finally caved. It was good to have more avenues to read the series. Get more people invested and interested. The most interesting piece of releasing a trade is that Diamond views it differently. People can reorder trades and they can be available for reorder for as long as there are a certain threshold of orders. They can even be resolicited later when the next issues come out. Much different from the one time hit of a monthly comic! So anyways, I decided to do it. Originally, I wanted to do a hard cover. Diamond encouraged a paperback. I decided to do both. I spent months finding a new printer. My current one couldn't make larger books and I wanted this book to be two inches wider in each direction to really get the art bigger. Make it something different. When I finally found a printer, I found out that printing what I wanted cost lots and lots of money. So without sure-fire sales and a guarantee that those books would sell, it was a bit too crazy to print two versions right now, especially for only 3 books. For the complete story? Yes, totally makes sense! Store em in a garage for life. But a collection of just 3 books? Meh. So I cut back. And back. And back. What I ended up at was basically a larger size version of the original books, about an inch in each direction and 3 times as thick. It's got a much nicer binding this time around so it should last some wear and tear. It's got all 3 books, The Tinklands, The Saltlands, and The Racelands, plus the early adventure The Tinderlands, as well as a couple of pages of the forthcoming Twistlands, and some pinups and other fun goodies. I tried to price it fairly at $13, a discount from buying all 3 on their own. Diamond pays me 40% of that. $5.20/book. That's all I get of the $13. To print the book costs between $2-4/book depending on quantity. For quantity to matter, you're probably up to $7-10k. Originally I hoped it would sell well through Diamond, 400-500+ copies, in which case I could print 2500 books. That would cover the hopeful reorders in the months to come, plus books for conventions, stores, etc. So I chopped it again to 1500 books. It looks like they're going to cost me ~$3.75/book. Plus shipping. Which is about $0.50-75/book depending on destination. So let's say a total of $4.25. OK, and yes, one could argue that I'm selling the book too cheap. But the point is not to make a profit. The point is to find and build an audience. I view now as the long tail when hopefully I can slowly find readers and spread, so that by the time books 6-7 come out, people will really be looking forward to them. The trade is posted online in plenty of places that sell comics like TFAW.com and such, or could be found or ordered through your local comic shop! Once I have copies in hand I'll be selling them through farlaine.com as well! I'll also be at the Boston Comic Con in early August and the Baltimore Comic Con in September. I should have copies of the trade by Baltimore.